Cucumber is always connected with beauty treatments, especially of the eyes. Cucumber slices are very beneficial when they are placed on your eyes. They offer a cooling effect to the eyes and help in removing dark circles and puffiness under the eyes. It is widely used in various dishes and added to salads. It has lots of health benefits and is regarded as a super food. It is also excellent for your skin and used in many beauty treatments. In this article we will discuss about the benefits of cucumber for the eyes. Cucumber for your Eyes – How good it works? If you are worried about the dark circles under your eyes, puffy or swollen eyes or any other such problems, cucumber is ideal for treating these issues. This is how it helps you. Take a small piece of cold cucumber and grind it to make a fine paste. Now add lavender oil or chamomile oil to this paste and also add some honey. Mix all of them well to get a fine paste. Apply this paste under your eyes lightly with your fingers. Leave this for about 10 to 15 minutes and then wipe off the paste with a soft damp cloth. This can greatly help in reducing the bags under your eyes. Cucumber cannot help you get rid of dark circles forever, but it can surely make the skin around your eyes look lighter for a time being. Often the skin around the eyes looks darker than the rest of the face. This spoils your look no matter how beautiful your face is. Placing cucumber slices on your eyes help in providing comfort to the blood vessels around your eyes and this can make the skin look lighter. It also brightens your eyes. If your eyes are tired by staring at the computers for a long time, cucumber is the best to sooth your eyes and makes your eyes feel fresh. Cucumber has moisturizing properties and can be used as a natural moisturizer. The skin is thinnest around our eyes and is therefore more prone to wrinkles and fine lines. 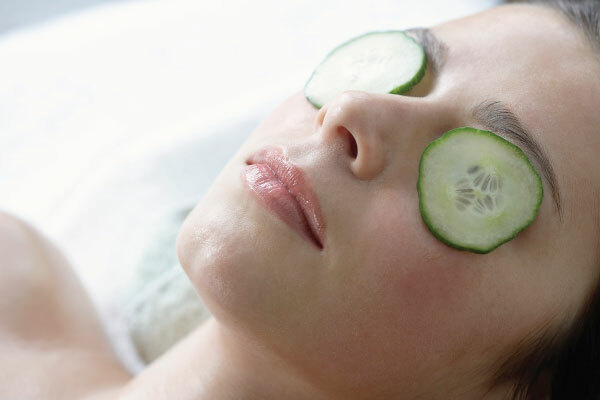 Placing slices of cucumber on your eyes is beneficial for hydrating the eyes and the skin there. This helps in preventing fine lines and wrinkles around your eyes. When the skin is hydrated, it is smoother and formation of lines is reduced. So, cucumber plays the role of an eye moisturizer. When you place cucumber on your eyes, the excess of water on the skin cells around the eyes is removed. It is this property that helps in reducing swelling of the eyes. Cucumber is rich in bête-carotene and this is an excellent antioxidant. It can reverse the harmful actions of free radicals in the body and can prevent any damage done by the free radicals. It also has healing properties. Flavonoids are also found in high quantities in cucumber, which helps in reducing inflammation. Are you spending a lot of time sitting in front of the television or working on the computer? Or are you under stress? These can lead to puffy eyes. Cucumber is an excellent remedy for reducing puffiness under the eyes. Just slice the cucumber and put these slices in the refrigerator for a while, till it becomes cold. Now put it on your closed eyelids daily. This will help in reducing the puffiness and also makes you relaxed and calm. It has the power to hydrate your eyes and bring down the puffiness with constant use. So, if you are suffering from any such eye problems, use cucumber and you will soon get positive results. Other than its benefits for the eyes, cucumber also has many other benefits. Cucumber is used as face mask. If your skin is oily, take half a cucumber and grate it. Add rose water to it and apply on the T-zone, which means the forehead, nose and the chin. If you want to reduce pores and make the skin tight, apply this mixture over your face, including the under-eye areas and the eyelids. Wait for about 15 minutes and then wash off with water. Pat dry with a clean and dry towel. This will make your face look young and glowing. Cucumber is good for sunburns. Cut slices of cucumber and place these slices on areas where you have sunburns. Leave it on the skin till it feels warm on the skin. The ideal way to consume cucumbers is to have it along with its peel. This is because the peel is rich in Vitamin C. Vitamin K, fiber, potassium, iron, zinc, and magnesium are also found in good quantities in cucumbers. It is even used to repel pests in the garden. Slugs often destroy the flowers in the garden. To drive them away you can use cucumber. Cut slices of cucumber and keep them in a small tin. Place this in your garden. A reaction takes place between the chemicals in cucumber and the aluminum. This produces a scent which is disturbing to the slugs and drives them away. Cucumber is used by many people as a home cleanser. If you feel tired and devoid of energy, have a few slices of cucumber. Vitamin B and carbohydrates present in cucumber will provide you with instant energy. It is even good for your hair and improves hair growth. They are excellent for the skin also. Cucumber can protect your skin from sunburn and it also has anti-inflammatory properties. The phytochemicals in cucumber makes the collagen in the skin to tighten the skin and make it firm.